The definitive publisher-authenticated version is available online at: http://www.oxfordjournals.org/ Copyright 2011 The author. Background. The number of indigenous patients with endstage kidney disease (ESKD) is increasing in Australia, reflecting a similar trend in other countries. Because many indigenous patients live in remote areas, peritoneal dialysis (PD) is often preferred. Compared to non-indigenous PD patients, indigenous patients have increased complication rates but the effect of residential locations on outcomes remains unclear. The aim of this study is to examine the association between race and PD outcomes stratified by location. Methods.Using theAustralia and New Zealand Dialysis and Transplant (ANZDATA) Registry, all adult ESKD patients commencing PD in Australia between 1995 and 2008 were included. Patients were stratified as non-indigenous or indigenous race and were grouped according to their residential location, the latter stratified into metropolitan, regional and remote areas. Outcomes evaluated included peritonitis, technique failure, peritonitis-related and all-cause mortality. Results. Regional and/or remote PD patients generally have a greater risk peritonitis-related complications and/ or mortality compared to metropolitan patients. 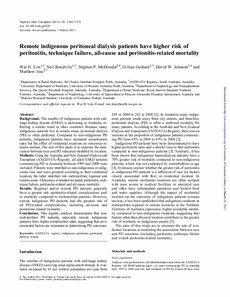 However, remote indigenous PD patients had the greatest risk of all PD-related complications, including all-cause and peritonitis-related mortality. Conclusions. This registry analysis demonstrates that nonmetropolitan PD patients, especially remote indigenous patients, have higher complication rates, suggesting that environmental factors are important in determining PD outcomes.